Improvement of their surface finish. Silicon molds are relatively inexpensive and quick to produce, while PU can take on many different properties such as flexibility gradation, mass colorization and flame retardant. 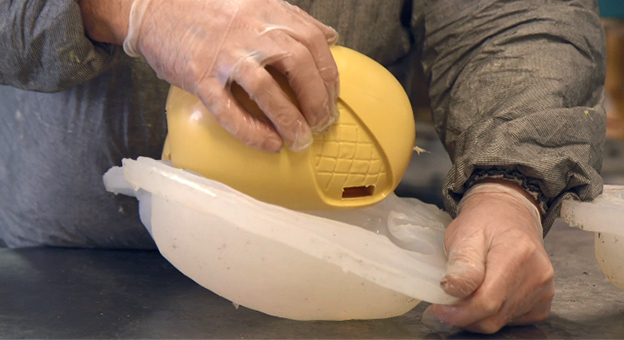 The wear and tear of silicon molds limits this technology’s cost-effectiveness to small-and-medium series production. Vacuum casting enables to tweak with many process parameters : combinations of stiffness and flexibility in one-piece, mass colorization to imitate tainted glass effects for example, precise textures such as leather-like surface of automotive interiors… MMB’s other crafts again multiply vacuum casting’s infinite possibilities. MMB has large vacuum casting capabilities, which are integrated upstream (e.g., SLA master-models) and downstream (e.g., post-machining, surface treatment, painting) for optimal operations. One custom-built vacuum casting machine is exceptionally large. MMB complies with the European Restriction of Hazardous Substances directive. PU products can come in direct contact with food or drugs. MMB has specialized in manufacturing transparent PU parts, which present a technical challenge. This proves useful for such products as cosmetics primary packing parts or light protections. Tools and equipment for polishing and sand-blasting.